Haida Gwaii - Queen Charlotte Islands and Prince Rupert - CanadaWeb Inc. This gallery features photos taken around Prince Rupert and the Haida Gwaii (Queen Charlotte) Islands in British Columbia's North West. The photos are of nature, wildlife, scenic, city, Haida Gwaii art and various other interesting things. The Queen Charlotte Islands/Haida Gwaii are a collection of about 150 islands resting on the western edge of the continental shelf. There are two main islands, Graham Island to the north and Moresby Island to the south. About 5,000 people share these islands, most residing on Graham Island in the communities of Queen Charlotte City, Tlell, Port Clements, Masset and the two Haida communities of Skidegate and Old Masset. Sandspit is located on the northeastern tip of Moresby Island. A 20 minute ferry ride and 130 kilometers of pavement connect the two islands and their communities. Each community is unique and collectively they offer a wonderful insight into island living. 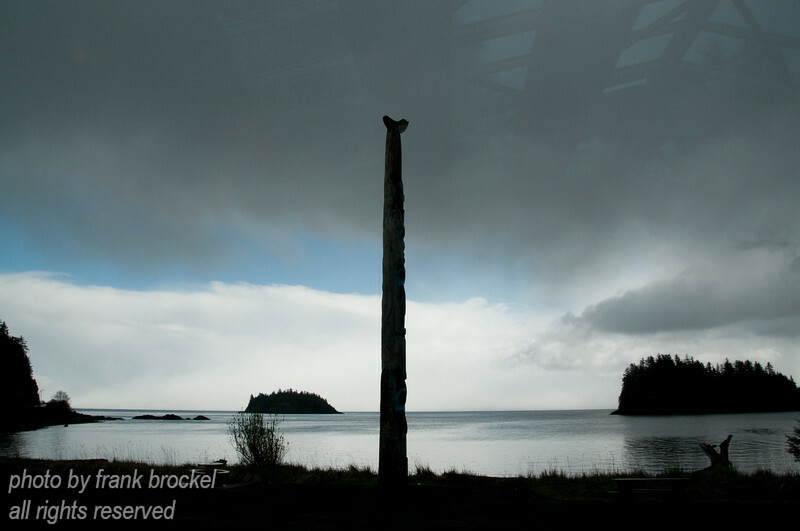 This photo was taken from the Haida Heritage Centre at Kaay Llnagaay (Skidegate) - a totem pole in the foreground.